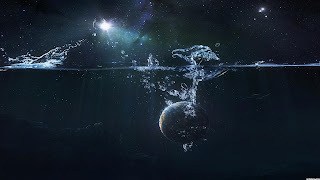 Water is a remarkable molecule; it makes up ~55% of our body weight, covers 75% of the Earth’s surface, and has been found in the farthest reaches of our universe in some of the most ancient galaxies. Water also plays a key role in the atmospheres of hot-Jupiters with its detection gaining us insight into the nature of their environments. There is just one problem. Water is so abundant in our own atmosphere, playing a pivotal role in the life cycle of all living species on Earth, that it gets in the way. Leaving us one option. To space we must go! And thanks to the crew of STS-125 HST servicing mission 4 in 2009, after a total of 36 hours and 56 minutes over five EVA’s, an instrument was successfully installed on the Hubble Space Telescope that is able to help us, Wide Field Camera 3. 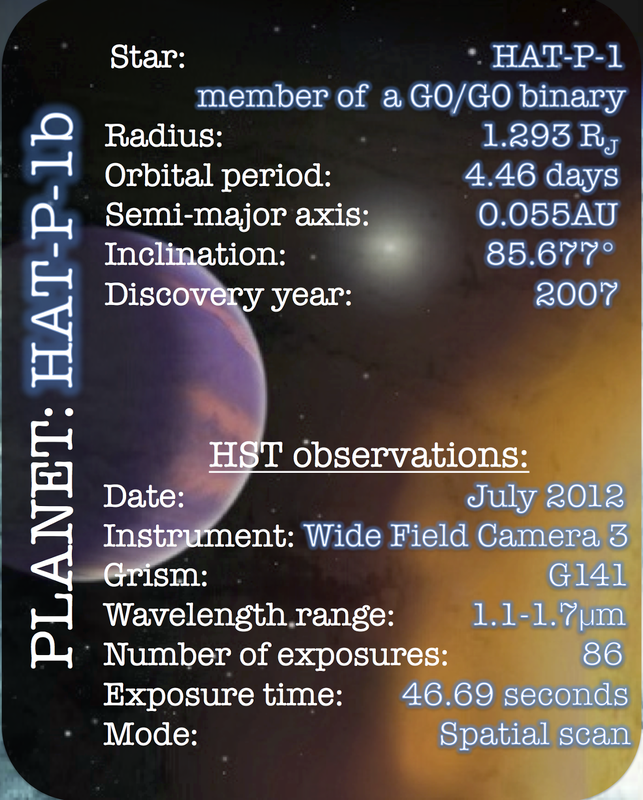 The fact sheet of HAT-P-1 and our observations. Using its infrared channel and low-resolution grism (a stepped prism) we were able to obtain the spectrum of the planet-hosting star HAT-P-1 giving us the first definitive evidence for water in the upper atmosphere of its transiting planet HAT-P-1b. As the planet passes in front of its star, relative to us, a small portion of the starlight shines through the planets upper atmosphere before reaching us. Imprinted on that light, as weak absorption lines, are the tale-tale signatures of various gasses. By measuring the amount of light received by the telescope over a range of different wavelengths you can build up a transmission spectrum of different chemical species to reveal what is in the atmosphere of the exoplanet. Water has a strong fingerprint centered at 1.4 microns, which lies in the center of Wide Field Camera 3’s wavelength range. To determine if our planet, HAT-P-1b has a significant amount of water in its atmosphere we separated each of the exposures of our observed stellar spectrum into a number of different wavelength bins. From this we are able to measure the change in planetary radius relative to that of the star caused when starlight is absorbed by water in its atmosphere. We then compared our results to models of hot Jupiter atmospheres tailored for HAT-P-1b to determine the significance of the water absorption feature seen in our transmission spectrum. Our measurements revealed that HAT-P-1b has a water-dominated atmosphere at its limb with temperatures cooler than that seen on the dayside of the planet. This observation, combined with other planetary transmission spectra from our large HST program and other published work, has revealed a startling diversity of close-in giant exoplanet atmospheres. Showing that water plays a key role in defining the nature of these strange new worlds. 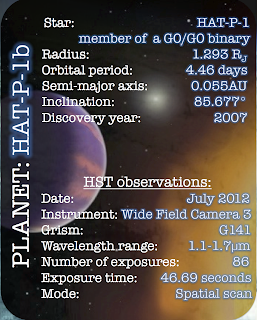 Left - the transmission spectrum of HAT-P-1b with a planetary-averaged HAT-P-1b specific model plotted in blue. This model has a greater than 5-sigma significance over a flat atmosphere corresponding to a straight line through the average planetary radius. Right - The Temperature-Pressure profile of the model compared to two models at constant temperature. My poster on this work is being presented at the Royal Astronomical Society National Astronomy Meeting in St Andrews this week (2013July 1st-5th) and can be downloaded by clicking on this link – Water in the atmosphere of HAT-P-1b poster. There is also a paper that is under review for publication in the Monthly Notices for the Royal Astronomical Society (MNRAS) so watch this space for an official link.